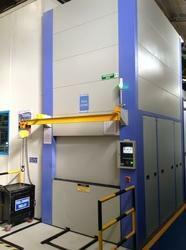 Our client can also avail from us High Rise ASRS Systems. 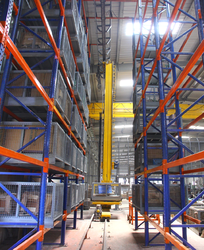 Depending upon the various needs of the clients, these versatile heavy duty high rise racking systems are easy to install, dismantle and re-assemble. The depth of the rack can be easily altered with the help of bracings. Further, with the help of maintenance free vinlock every ton of material can be easily stored at a very minimal cost. PMI Global Technologies Pvt. Ltd.
As part of our complete suite of material handling technologies, we offer automated storage and retrieval systems to meet your warehousing, distribution, and manufacturing needs. Flexibile enough to meet your unique requirements, our storage and retrieval machines and automatic inserter/extractors will minimize storage space and maximimize the efficiency and productivity of your operation.